Well I was browsing through the MT gallery a while ago, and came across this scan. I really liked it and immediately thought of walling it as a widescreen scenic wall. The scan was full of text and pics and had a line going straight down the middle. Also Kiraras face was cut off and Shippous face was smooshed. >< A lot of painting was going on here. I painted the houses, mountains, and sky (I lurve painting skys :3). Also, the annoying grass was painted. The water and reflections were messed up to so I had to redo those as well. I cleaned up the scans of course, and also I had to fix the squished and cut out faces. So I gave Kirara a nose job, and redid Shippous face and hair. xD loL! ps. do you plan on becoming a makeup artist/plastic surgeon? lol. Awesome reconstruction! The sky is fab and the grass and characters are neatly re-painted, especially when you compare it to the original scan. Great job! I like the enjoying atmosphere and the panoramic view. It's a good idea to do this scan as a wall. Nicely repainted. It looks so much better in Full View! and you did a fantastic job recreating the bg. Very nice scenery, and great job on reconstructing the scan. Keep up the great work! You really put much work on it and the scene looks awesome! 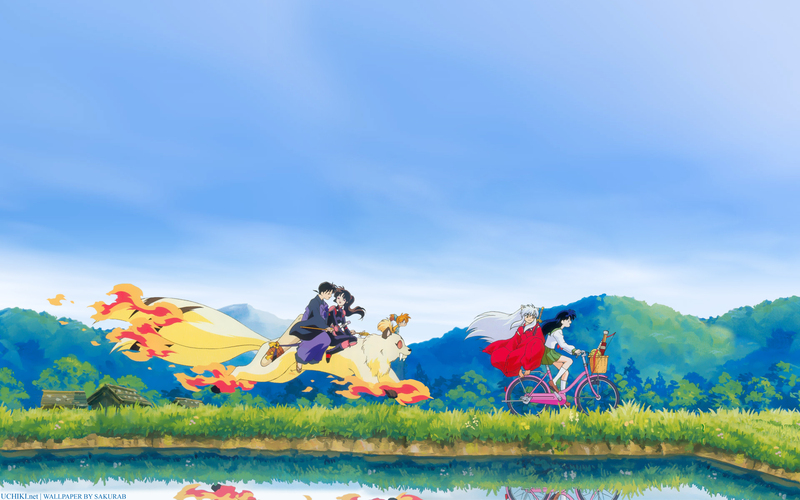 That is a very pretty wall, and even though my enthusiasm has died down for Inuyasha I'm still very happy to see it. *Adds to growing MT wallpaper collection* Awesome job painting - even the "annoying" grass. I know that the placement of the characters is based upon the original scan, but it'd be cool to see them near the top and have their full reflections in the water. (Haha! I pose to you a challenge...though I'd very much understand if you just say, ":P Nuh-uh. I don't think so." lol. ^_^' ) Awesome wall and kudos to you for the reconstruction of Shippo and Kirara. :) I can't even tell. This is a really great widescreen wall, it's gorgeous! Wow! Great work! I always loved this scan! omg! I love this! I've alway admired that scan! this is just too nice! thank you for your hard work! Wow! Gorgeous scan! Wonderful background clouds! nice and peaceful. Great wallpaper!